I know I look quite big*. As if I weren't here. I'll ... uh ... be sitting quietly. Hey ... is that a sandwich you're eating? This post brought to you as part of Blogtoberfest - October's blogging festival. Sandwich! That guy looks like he'd eat a three course meal.....and come back for seconds. 52cm! Yikes. Just give him lunch now and save yourself. Step 1: Back. Away. From. The. Sandwich. Step 2: Watch giant bird devour said sandwich. Step 3: Take off running if he still looks hungry! What a delightful visitor. I would have liked to get out the good afternoon tea set. as.scary.as.kokkaburras that ate my husbands steak from his plate! 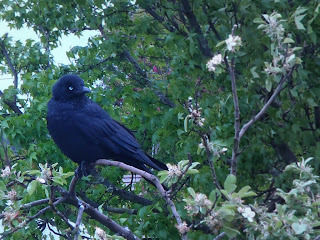 Am trying to come up with suitably spooky lines from Poe's The Raven but I can't without cheating on Google so you will just have to imagine something suitably spooky. Image - taking measurements of bust, belly and head to tail on that bird - 52 centimetres!!!! Haha, I love birds but yeesh - when you have something they want, just give it to them and run away.